Utah Officer Fired For Arrest Of Nurse, Recorded On Video : The Two-Way Salt Lake City Police Chief Mike Brown says his detective was wrong when he roughly arrested a nurse who tried to explain hospital policy for drawing blood from an unconscious patient. 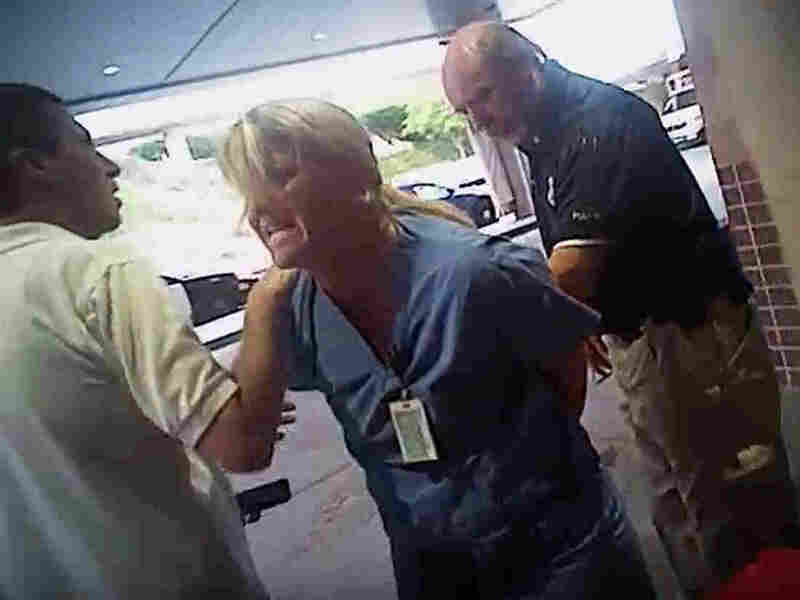 A video frame taken from a police body camera as nurse Alex Wubbels is arrested by a Salt Lake City police officer at University Hospital in Salt Lake City. The Salt Lake City Police Department has fired the police detective who was recorded on video aggressively handcuffing a hospital nurse who refused to allow him to draw blood from an unconscious patient in July. The video, recorded by a police body camera, of the rough arrest of University Hospital nurse Alex Wubbels went viral, drawing widespread condemnation and renewing the national debate over the appropriate use of force by the police. Salt Lake Police Chief Mike Brown relieved Detective Jeff Payne of his duties and disciplined his watch commander, Lt. James Tracey, by demoting him to the rank of officer. The action comes after an internal affairs report released Sept. 13, which found that both officers were in violation of department policy. In a highly detailed "notice of decision" letter, Brown said the two officers failed in their requirement to treat all citizens "equally with courtesy, consideration and dignity." The incident was sparked by the case of an off-duty Idaho reserve police officer whose vehicle was struck by another motorist fleeing the police in a pickup truck. Payne came to the hospital insisting that blood be drawn from the unconscious reserve officer. Wubbels was arrested after "repeatedly and calmly" explaining to Payne that hospital policy required a warrant or the patient's consent before blood could be drawn. Brown faulted Payne for, among other things, not seeking to de-escalate his confrontation with Wubbels by taking his demands to her supervisor. "You inappropriately acted against Ms. Wubbels," wrote Brown. Payne and Tracey have five days to appeal Brown's action.